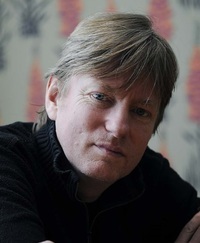 Michel Faber was born in The Hague, The Netherlands. He and his parents emigrated to Australia in 1967. He attended primary and secondary school in the Melbourne suburbs of Boronia and Bayswater, then attended the University Of Melbourne, studying Dutch, Philosophy, Rhetoric, English Language (a course involving translation and criticism of Anglo-Saxon and Middle English texts) and English Literature. He graduated in 1980. He worked as a cleaner and at various other casual jobs, before training as a nurse at Marrickville and Western Suburbs hospitals in Sydney. He nursed until the mid-1990s. In 1993 he, his second wife and family emigrated to Scotland, where they still reside. CLICK HERE FOR MORE BOOKS BY MICHEL FABER. Since Bill and I both read Michel Faber’s newest novel, The Book of Strange New Things, at the same time, we’ve decided to share this review. 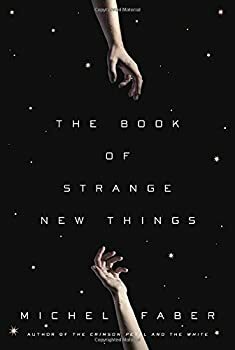 The Book of Strange New Things is a marvelous exploration of human faith and faithfulness in the most trying of circumstances. It follows Peter, a British evangelical minister, as he undertakes a missionary venture on Oasis, a recently colonized planet. Behind him he leaves his wife and partner in faith, Beatrice, to continue their ministry on Earth. However, life on Earth gets increasingly difficult and dangerous after Peter leaves, and his relationship with Bea — continued solely via e-mail — begins to fracture as their experiences of God diverge.